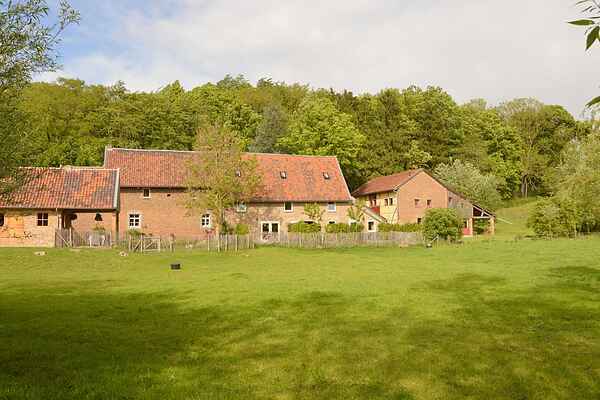 These two holiday homes with free views on the Gulp valley are located in the village of Slenaken, South Limburg. The apartments were built in the former cow stable whilst preserving various authentic details. The Hoeve is a National heritage monument and dates from 1741. The decoration of the holiday homes is cosy and comfortable. The Gulp river flows along the field of the holiday homes. From here you will enjoy beautiful panoramic views to Teuven in Belgium. Slenaken is a small village in the municipality Gulpen-Wittem in the south of Limburg, near the Belgian border. The region is often called the Garden of the Hilly land. Rolling hills, babbling brooks, green pastures and pretty half-timbered houses. The village is located in a valley where the Gulp flows. There are various walking paths which lead you through the beautiful hilly land. And after all that effort you can enjoy a Limburg beer in one of the cosy pubs of Slenaken. Slenaken is also a perfect base to go discovering the region. Typical Maastricht is 20km away and cosy Valkenburg 14km . The Belgian Voerstreek is also nearby and definitely worth a visit.